In Depth: Is Keith Olbermann About to do an “O’Reilly”? Well now Olbermann finds himself with a “punch down” scenario of his own to ponder over. Despite Tucker Carlson’s claims to the contrary, I still believe this is something of a PR stunt designed to make the Daily Caller a player on the internet, all the ridiculous First Amendment chest thumping non-withstanding, with the Daily Caller being the thorn in Olbermann’s side that Olbermann was to O’Reilly’s side. I’m not a lawyer but I don’t think The Daily Caller has too much of a legal leg to stand on and if Olbermann goes after it, he could very well prevail. But at what cost? Court cases like these are long dragged out affairs. And you can bet The Caller will play up the court case in the press to the hilt, regardless of how thin its legal defense may be. Plus there is the thorny issue of Discovery. Is Olbermann willing to expose himself to a fishing expedition into his private affairs? Because that’s what discovery would mean to him. Depending on how Olbermann plays this, it could wind up being a lose-lose scenario. Best case scenario is Olbermann wins in court but at a tremendous cost beyond financial terms where he has to punch down and elevate the Daily Caller, similar to the way O’Reilly punched down and elevated Olbermann. From my vantage point, the best move is to make no move. Ignore Carlson and The Caller. Nobody but the Right is going to care then what happens because the Right hates Olbermann. The press won’t care because Olbermann isn’t playing along and the press is only interested in spats where both parties are involved. They may try to egg Olbermann on for a comment but he must resist the temptation. The press will then lose interest and The Caller will become the next Olbermann Watch where only the true believers come to listen to what they want to hear. But if he does what O’Reilly did and engages The Caller directly, the press will be all over it and The Caller will have succeeded in its PR campaign. This entry was posted on July 15, 2010 at 2:50 pm and is filed under In Depth, MSNBC. You can follow any responses to this entry through the RSS 2.0 feed. You can leave a response, or trackback from your own site. How can it be anything but a PR stunt? This isn’t a serious action on Carlson’s part. What’s the endgame here? This is, as you point out, simply to goad Olbermann and generate some buzz (not in that order). I think they both lose with this fight in the long run. Tucker may get some momentary notoriety from becoming the new OlbermannWatch, but it turns a site that has been gaining traction as a libertarian version of HuffPo and The Daily Beast into a cheesy Chickaboomer-level name-calling joint. Carlson may be punching up but he’s punching at Olbermann’s knees. Punching up and down at the same time (neat trick). He looks silly doing it and it’s not much of a fight to watch. If he’s smart he’ll treat it with humor much like Maddow did when Scott Brown used her name a fund raising tool. That worked great for her profile & Brown came off as not the brightest light on the porch. I don’t know if that’s what he will do but we should get a hint tonight. My guess he makes Tucker worse (not worser or worst) person in the world and doesn’t mention the Daily Caller by name. Fritz, in light of your comment about Ratigan: Keith? Humor? Yeah I know Joe It’s not the thing that first comes to mind when you think KO, but he does seem to have a sense of humor; booking comics as guests and his over the top reading of Thurber on Fridays. Unlike Ratigan, there is humor on his show on occasion; even if he is, shall we say “wooden”, most of the time. But he can deal with a subject with some wit when he wants to. . Yes, but unfortunately, rarely when it comes to his critics, and he has already shown a penchant for attacking Tucker’s site. Tonight’s show shall be interesting.. But he can deal with a subject with some wit when he wants to. Not when he’s the target, it seems to me. Besides there’s a political component in this and Olbermann has never shown an ability to walk away from a political fight. Particularly if it comes from the right. Had this been an apolitical or nonpolitical website, I can see him walking away. But from a conservative/libertarian source? Doubtful. KO has already revealed on Twitter how much this bothers him. I am in PR, and if I were advising Olbermann, I would BEG him not to mention this again. This stunt only works for the Daily Caller if they plan to have someone producing entertaining copy for keitholbermann.com on a daily basis. Otherwise, the stunt’s cheapness blows up in Carlson’s face, and that’s all his young publication will be known for. To try and compare this to the Bill O suit is silly. That was totally ridiculous and lacked any legal merit. And Bill O just whined and ***** like a little girl and forced News Corp to make an arse out of themselves. I certainly doubt NBC/MSNBC is going to waste their lawyers on this. This will be Bathtub Boys responsibility. Now, If Keith’s lawyers have any brains they won’t fight this in court. They will advise him to arbitration with the UDRP. It doesn’t cost much to file, its quick (in relation) and far cheaper. That is unless they want to stiff Keith for many many billable hours @ $600 or more an hour. But they they wouldn’t be doing right by their client. Keith will have to prove he had prior rights to the name. He does–its his own name. He will have to prove the owner doesn’t have rights. Tuckers already made mistakes mouthing off about it that could probably already sink him in arbitration. Lastly he must prove that it was registered and being used in bad faith. If he wins he just gets the domain name back and that’s out. No damages etc. But who cares. I would take it to arbitration and use Tuckers own interviews on the subject to sink him. Star you aren’t paying attention. I’m not talking about O’Reilly’s lawsuit, I’m talking about O’Reilly’s response to Olbermann. Chickaboomer is running with this graphic. You’re right ICN, I didn’t bother reading this one. You had already compared it to the Bill O/ Franken thing in another. But after I read what you wrote, its totally wrong. You have the best case Keith winning and it costing a fortune. It doesn’t. That’s why he will go to arbitration and most likely win the case. You throw all this “discovery” and personal life garbage in there. Its meaningless to this case. Here’s where I agree with Star. I’m agnostic (agnostic = stupid) on the legal issues but I can’t see how discovery (were it to occur) would lead to some embarassing revelations about Olbermann’s personal habits or professional behavior. Discovery isn’t a fishing expedition, as I understand it; and since it’ll have to be limited to what Olbermann did re domain registration or copyright protection, how is that going to reveal anything embarassing? Besides, I don’t even think discovery applies here. Does it? I didn’t bother reading this one. Because surely Spud would repeat an entire post with nothing new to add, right? Anyone wanna guess tonight’s WPITW? I noticed the Mediaite story. What Glynsis failed to mention about the TUCKER CARLSON case is it didn’t go to trial. Tucker did EXACTLY what I said Keith will do….he went to arbitration with the UDRP. Feel free to just link to my posts for the REAL ANALYSIS of the KEITH/TUCKER spat. It’s a miracle! (In homage to The Great Narcissist, I will inject myself into the story) Asking Keith Olbermann to not react to Tucker is like asking me to ignore flame-throwing trolls: theoretically possible, but damn hard to pull off. Yet..HE DID IT! Imagine the restraint that must have taken.. I will doubt he will ignore it. Remember when he brought his degree from Cornell on air just to prove Ann Coulter wrong? that is pretty minor compared to this. My money is that he will punch down, he certainly has somewhat of the ego of O’Reilly. To use a sports metaphor, as Keith might: Tucker Carlson couldn’t hold Keith Olbermann’s jock, as much as he might want to. Gotta hand it to the guy. I’m shocked that he may have learned the lesson of Billo. Hell, it took O’Reilly years to figure that one out. Yeah, I was waiting for KO to throw it in at the last minute, but he managed to avoid mentioning it. Like everyone else here, I would have lost that bet. I’m not saying KO is out of the woods yet (Tucker may “escalate” and continue to tweak him, thereby forcing KO’s ego to respond) but he’s managed to suprise me with his restraint, which is not a word anyone normally associates with KO. Tucker’s probably pretty pissed off right now though. Good. Tucker having a good ol’time right now..this is clearly revenge…Tucker worked at MSNBC with KO and knows what kind of horrible person he is and how badly he treats people who work there…and as he commented today a lot of people at MSNBC are secretly cheering him on. I was surprised that Olbermann didn’t mention it at all tonight. But I don’t think he will be able to hold out. This is the same guy who stormed “off” from the Daily Kos like a baby after reading one negative opinion in the comments section of a post he made. There’s no way he can hold himself back once that site is up and running and lampooning him, especially with Carlson being behind it. You have the best case Keith winning and it costing a fortune. It doesn’t. That’s why he will go to arbitration and most likely win the case. You’re still not getting it. It can and will cost him a fortune even if it doesn’t cost him a thin red cent. In this case the cost will not be measured in dollar amounts but in publicity…publicity for The Caller in its war with Olbermann. Before today Olbermann was known as the thorn in FNC and O’Reilly’s side and the bane of Conservatives’ existence. After today, if Olbermann goes forward with a head to head war with The Caller, Olbermann will be known also as the guy who can dish it out but can’t take it. If KO doesn’t comment and just ignores the whole thing the story goes away in a couple of days. To take on the Daily Caller publicly just gives them what they want publicity. I’m don’t even think he should take it to arbitration as that would keep the story alive in blogs like this one. I’m sure FNC will try and keep the story going but even they will move on if they don’t get a response after a few days. It will be interesting to see if Kurtz mentions it on Reliable Sources. My guess yes but only as a news item. He’s already known as that….that’s why Tucker did it he knows personally what kind of crybaby KO is. Oh I get it. Your whole premise above is totally off the mark. You never went back and edited it or updated it with what would really happen. Never bothered to mention how Tuckers case came out (like I pointed out). You should have struck out 95% of the in depth analysis because it was totally false. 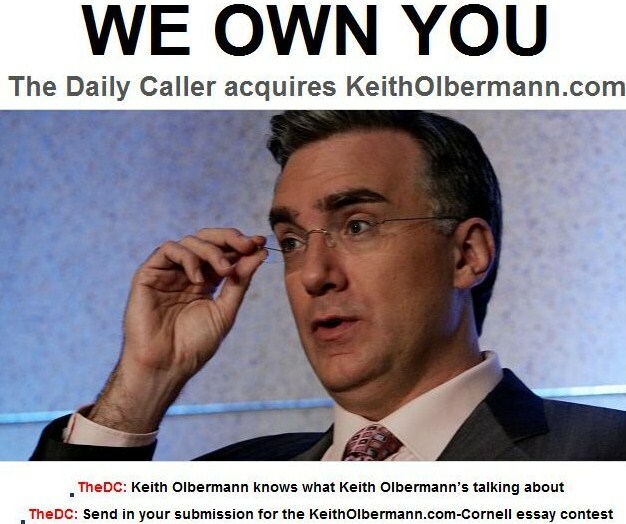 Good luck in the Daily Caller getting huge publicity if Keith takes them to arbitration. It’s a non-story. Especially since Tucker Carlson did the same thing. All it does it paint Tucker as a insert other letter in his name. And Tucker would get far more publicity if Keith didn’t make good on his comment to get it back. He could daily bash him for being a coward and not following through with his threats etc. If Keith doesn’t sue for monetary damages (like he wont) but just goes to arbitration to get his name back then Keith looks smart and Tucker looks small. Wrong again. The guy extorting Tucker didn’t want publicity. The Daily Caller does. So of course The Daily Caller will play even something as mundane as arbitration to the hilt. I didn’t say the guy who held the TuckerCarlson website wanted publicity. Tucker can try and play up arbitration to the hilt but the Daily Caller is a minor peon in the world and its not like the other media will jump on this to give him the story he would want. Tucker is already shown himself to be a hypocrite and a moron. Any publicity will be pointing out what an idiot he is in the case. You don’t go to arbitration over this before and then try and hold a domain over someone else. Even Keith haters will admit Tucker and the Daily Caller and the morons. And you still haven’t bothered to cross out most of the wrong analysis above. Keep it pithy. Keith will go to arbitration. Tucker will “try” and gain publicity out of it but will fail because he’s a hypocrite with his own arbitration suit to win back domain. That sums it up.